Now I want to tell you, one of my recipe when I fell stress. This is a very simple recipe that relies on your already purchased unscented lotion and an essential oil combination that will soothe and calm you. Mix the essential old together in advance in a glass bottle and allow them to sit and mellow for a few days. Add the oils to the lotion and shake well. Be sure the lotion is not cold or hard for this process, so the essential oils can blend into the lotion base. Even the small amount of essential oil in this blend is great. You can add a few drops more of the lemon or lavender if you’d like. But I don’t advise increasing the clary sage as it can be very overpowering. Use as you do any other lotion. Enjoy! Don’t forget to rating, comment or help me to share this tips. Catcha! -blue. I have never figured out why this knowledge started slipping away from us, but I am trying to re-learn some of the basics. Now, I want to tell you, how to make your own soap. My soap recipe is customized to use full bottles of most of the oils, so you don’t have a lot of inventory lying around, and you don’t have to do a lot of measuring. Normally, making soap requires a lot of finicky weighing, since measuring by volume isn’t considered accurate enough. So far I have had no problems, and, for those without a scale, I give both weight and volume in this recipe. Before we begin, let me stress that soap-making can be dangerous. Although it is easy to become comfortable with the process, you should only make soap when you fully understand the safety procedures. 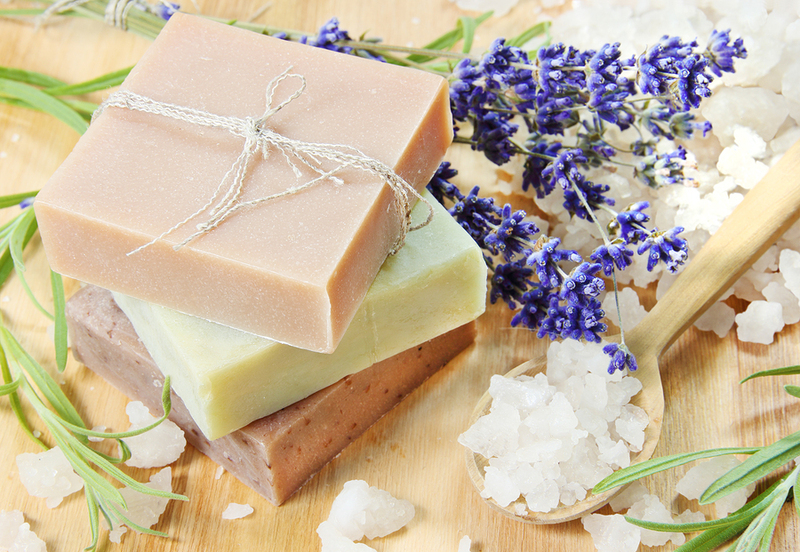 Soap is made in two parts, lye and water, plus a mixture of oils. The two don’t combine easily, so they must be brought to similar temperatures. Lye and water get very hot when mixed, so the mixture must cool before being added to the oils. The oils must be gently heated. The oil is nowhere near hot enough to cook with, but still, please do not start any fires. Every oil has a different saponification index, which is a measure of how much lye is required to turn that oil into soap. This means, if you run out of coconut oil, don’t go replacing it with olive oil. You will also need a mold. You could use a 9 x 13 cake pan and line it with wax paper. I bought a used Rubbermaid bread box that is about 14″ x 6″ x 5″. This makes a big block of soap that is not safe to cut with a knife. I cut it with a guitar string wrapped around a couple of chopstick handles. The hardest thing about soap is knowing when it is done. This is judged by a state called “trace.” This is when a dribble of soap kind of stays on the surface instead of sinking into the pot. Think honey on a counter top as it slowly flattens out. Lye — Mix in large pyrex measuring cup, stir with a chopstick saved from order-in Chinese food. Again, do not breathe the fumes. Wear goggles. Let lye mixture cool to 110 degrees F. Warm oils to 110 degrees F. When both are at the same temperature, slowly pour lye mixture into oils. Mix with a stick blender until trace, periodically scraping sides and bottom of pan with a spatula. I mix with short pulses of the blender, and it only takes about three minutes. The first time I made soap I used a whisk and my spatula, which I washed carefully later. Next time I used my stick blender. Once I felt sure that I was going to make soap regularly, I bought a used stick blender at Value Village for $5 and dedicated it to soap making. If you use a whisk, you can look forward to hours of stirring. I also have a couple of thrift-shop thermometers, one for the lye and one for the oils. I have also heard of people making soap by feel. When the containers of lye and oils feel similarly warm to the touch, you are good to go. At trace, add 10 milliliters cinnamon oil. Mix as little as possible, just enough to combine. Theoretically, the soap can harden very quickly at this stage, trapping your spatula inside a giant bar. I have never had a problem with this recipe, though. Pour into mold. Wrap with heavy blankets for 24 hours to keep the heat in and help the chemical reaction. The next day, when soap has set, cut it into bars and store, separated nicely, on brown paper in cool place. Turn over after two weeks. Use after one month. Yeah like the tittle, now I will give you a tips and how to get the natural beauty treatment. Have you ever thought about making your own shampoo? I know, I know. With the dozens, if not hundreds, of commercial shampoos available to us, why bother making our own, right? Like with most things, homemade shampoo is far cheaper than commercial bought shampoo. Especially if you have a larger family, making your own shampoo is going to save money for you. Do you know what all those chemicals are in your commercial shampoo and conditioner? Me neither. The FDA doesn’t regulate what companies put in personal care products, which means most of us have no idea what the chemicals are or how they could be affecting us. The majority of large companies like Suave, Pantene, and Aussie use chemicals that have been linked to cancer, immunotoxicity, allergies and more. You can find out more by checking out this Skin Deep page and looking up your own shampoo. Making your own shampoo is safer for you and your family because you’re using natural ingredients. This is going to be highly subjective. Some people claim that their homemade shampoo works far better than commercial brands. Other people say they’d buy commercial shampoo any day. How well your shampoo works is going to depend on the recipe you use as well as your hair type. But there’s a good chance it will blow your store-bought shampoo out of the water…in a good way. When you use natural shampoo what goes down the drain? Natural ingredients. Commercial shampoos and conditions contain tons of chemicals, which go right into the water system (especially if your greywater isn’t treated). So, natural shampoos are better for the environment. Natural ingredients are way better for your pipes. The harsh chemicals in these shampoos can cause major damage to your pipelines which will ultimately cost you big-time financially. So, do you think to make a homemade shampoo? Instructables is one of my favorite sites because you can learn how to make just about anything here. And they’ve got a great recipe for homemade shampoo. This recipe uses liquid Castile soap. Mix all the ingredients into a plastic or glass bottle and you’re good to go! As far as the results, it’s a mixed bag with this recipe. Some people love this combination; others says it leaves a film on their hair. Again, a lot will depend on your hair type and your water type (hard water seems to leave more film). The awesome ways to save money with baking soda extend to shampoo as well. Baking soda is the household product that I buy in gigantic, 5 lb. bags from Costco and boy does it go fast. I use it for everything, including shampoo! The biggest benefit to using baking soda is that it really helps get rid of the buildup that settles on your scalp from other hair care products. But, you have to rinse with vinegar if you want your hair feeling as light and fluffy as it always does. Alone, baking soda has a tendency to dry hair out. Mix 1/2 cup baking soda with 3 cups water (this will make enough for several washings). Store in a plastic or glass container. You can also make it one serving at a time. Mix 1 Tablespoon of baking soda with 1 cup of warm water. When you’re ready to use, shake and apply to your scalp, scrubbing it in. After you’ve scrubbed your scalp with the baking soda, rinse with 1/2 cup of apple cider vinegar (or regular white vinegar for a lighter smell). You can also use 1 Tablespoon of vinegar mixed with 1 cup of water for a lighter mixture. Keep in mind that there are as many natural shampoo recipes as there are people experimenting. You might need to play with proportions before you find a combination that works great for your hair. Tip: It might take two weeks or more for your hair to “settle in” to being washed with baking soda and vinegar. The reason is because right now, your commercial shampoo (and daily washing) strips your scalp of natural oils. When you go natural, your hair might feel greasy or thick as your body adjusts. Stick it out! It’s also best not to wash your hair every day, whether you’re using natural shampoo or not. Washing every other day will help keep your hair and scalp healthy. If you want to learn more, here are some other tips on making your own shampoo. Have any of you used experimented with making your own shampoo? How did it work out? Share us fellas~! Welcome back to my wordpress, now I will write about natural beauty and I will update about #NaturalBeauty this year. Because I see chemicals in many our beauty treatment. So, now I will tell you how to do this. Say to yourself, “I AM THE BEST” or say hallo to universe “HALLO WORLD” when you wake up. Take at least 15 seconds when you see a mirror, and smile to yourself. Think positive everything before you judge something. ow you everyday, don;t forget to give your best smile. If someone dare you to do something, always say “I CAN DO THIS”, because you are the best motivator for yourself. Make a resolution with a piece of paper and write what your want for a week. Try to dare yourself to get the points in your resolution paper. If you failed or the result too bad, never say “GIVE UP” because if you always try to get that, you will get what you want. Keep pray to god, tell god what you what and give the god the reason why you worth it to get that. Love your parent, and give your best attitude from them. Because only with their grace you will get the god’s grace. If you choose a way, do your best and never dissapeared in the end.